Carambola, or starfruit, is still considered a rare tropical fruit, but – in addition to its delicious flavor and eye-catching shape – its many health benefits and medical applications have caught the attention of the global scientific community. Originally from Southeast Asia, carambola has been cultivated there for centuries, being a common crop in the provinces of Southern China as well as in Taiwan and India. Although it is considered a rare tropical fruit, carambola has gained popularity around the world, especially in the Philippines and Queensland, Australia. It also grows in Tahiti, New Caledonia, Netherlands New Guinea, Guam, and Hawaii. Carambola plantations are also getting bigger in the Caribbean, Central America, tropical regions of South America, West Tropical Africa, and Zanzibar. Reducing inflammation. 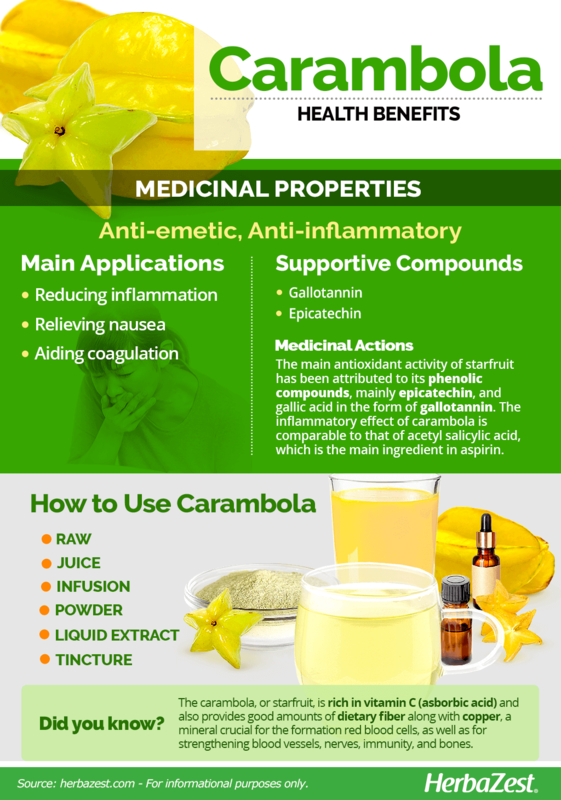 Stem extract of carambola has shown an anti-inflammatory effect comparable to that of acetyl salicylic acid, which is the main ingredient in aspirin. Relieving nausea. This tropical fruit is widely used to alleviate the symptoms of hangover. Aiding coagulation. Carambola have been traditionally used for halting hemorrhages and relieving bleeding hemorrhoids. Treating skin disorders. As an external application, it is also used for chronic skin conditions, such as psoriasis and atopic dermatitis. Lowering blood sugar. 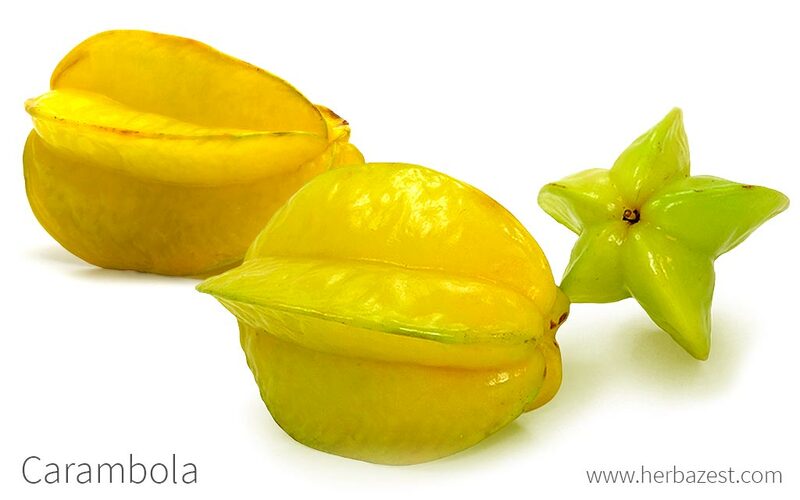 Starfruit has hypoglycemic properties, decreasing blood glucose levels. Eliminating worm infestations. As an anthelmintic, carambola leaf extract effectively helps to exterminate and expel parasites. Relieving ulcers. 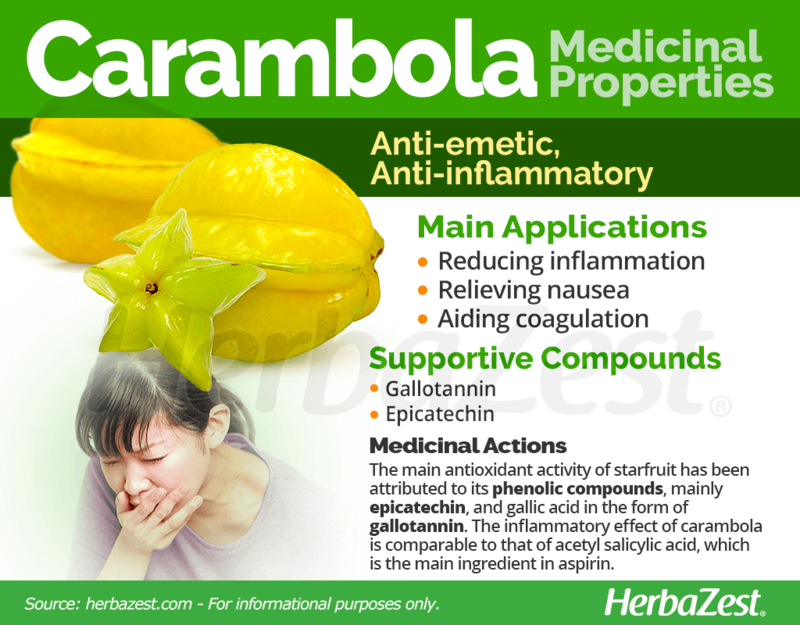 Due to its triterpenoid, flavonoid, and mucilage content, carambola has partial anti-ulcer activity. Although is not clear which active components contribute to carambola's properties, the main antioxidant activity of the fruit has been attributed to its phenolic compounds, mainly epicatechin, and gallic acid in the form of gallotannin. Studies indicate that the more mature the fruit, the more antioxidants it contains. These antioxidants responsible for destroying free radicals in the body, thus hindering cell oxidation. This powerful action not only strengthens the body against diseases, but also slows down the aging process. Ginger also possess anti-emetic properties, and similar anti-inflammatory benefits can be found in herbs like grapes and turmeric. Although carambola is fairly harmless, it all depends on the doses ingested. Over-consumption can cause acute inflammation in the urinary tract (nephropathy) due to the oxalates contained in starfruit juice. Carambola fruit ingestion by patients with kidney failure causes high mortality even after dialysis. Toxicity has been registered in patients under hemodialysis treatment, with symptoms that range from hiccups, nausea, insomnia, and agitation to mental confusion, seizure, and hypotension. People who tend to form calcium and oxalate stones should also be cautious consuming carambola, which is among the foods that are high in oxalate. There are no reports of carambola toxicity in people with normal renal function. On the other hand, diabetics taking drugs to control blood sugar levels should avoid consuming carambola in therapeutic doses, since it can potentiate the hypoglycemic effect of the medication. Those who are scheduled for surgery should avoid consuming carambola, since it contains agents that inhibit drug metabolism. Starfruit has been shown to reduce the effect of midazolam, which is a benzodiazepine commonly used before medical procedures and surgery to induce relaxation, as well as temporary loss of consciousness. In large amounts, starfruit has also shown to negatively affect the absorption of drugs like salmeterol, saxagliptin, amiodarone, codeine, and iloperidone. In high doses, carambola has abortifacient properties. During pregnancy, women should consume this fruit with extreme caution or avoid it altogether in order to prevent miscarriage. It is recommended to seek the advice of a qualified healthcare professional before starting any kind of herbal treatment. Carambola, or starfruit, is rich in vitamin C (asborbic acid), which possess strong antioxidant and immune boosting properties, and it also provides good amounts of copper, a mineral that plays a major role in the formation red blood cells, as well as contributing to maintain the health of blood vessels, nerves, immune system, and bones. Additionally, the digestive and hipoglucemic properties of carambola can be attributed to its good content of dietary fiber, whereas adequate amounts of vitamin B5 (pantothenic acid) aid with the proper metabolism of fats and proteins, making of the starfruit a great option for weight management. 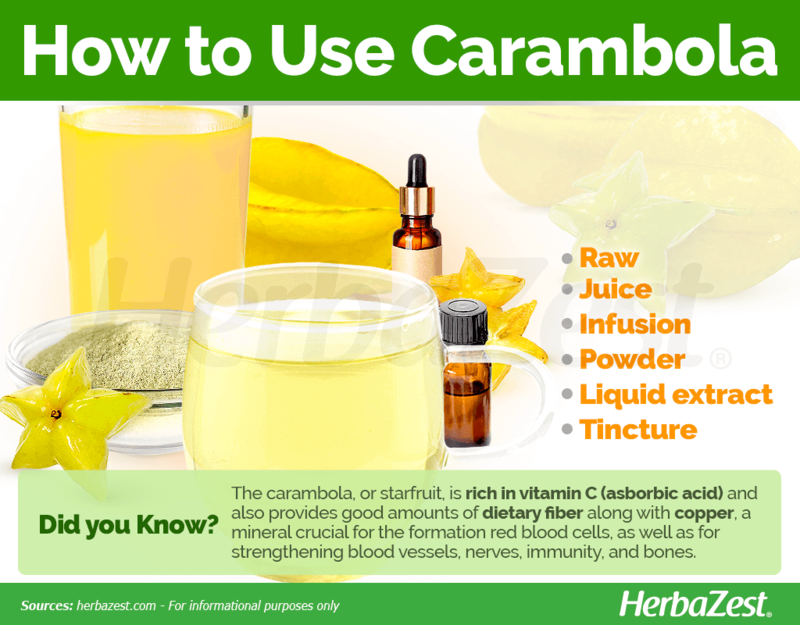 The nutritional value of carambolas is rounded by small quantities of many other nutrients, including minerals like potassium, magnesium, and manganese, along with vitamins of the B group, like B3 (niacin) and B9 (folate). 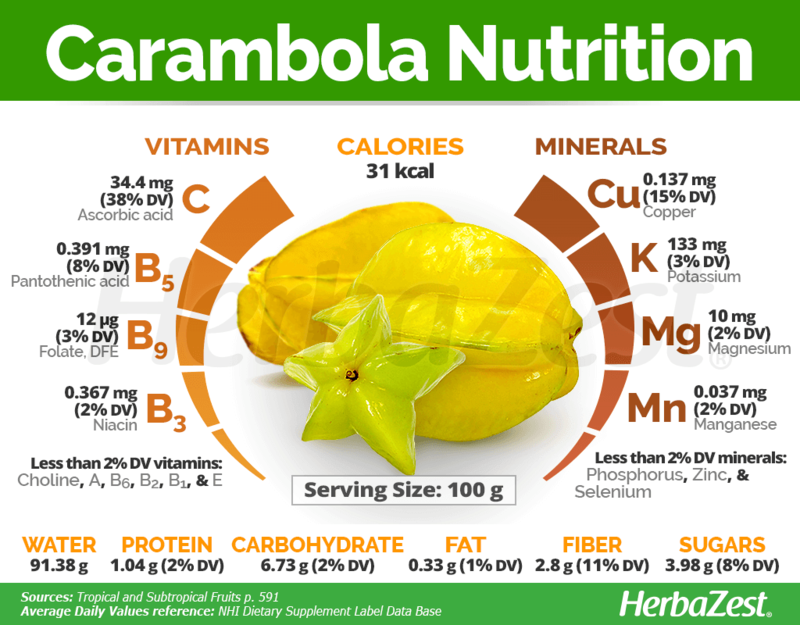 100 grams of fresh carambola fruit provide only 31 calories, as well as 11% of the daily value for dietary fiber. In the tropical areas where it grows, carambola or starfruit is consumed mainly in culinary ways. However, this fruit can also be found in supplemental forms, often mixed with the active compounds of other herbs, as well as in herbal remedies that concentrate its benefits. Raw. As a ripe fruit, carambola can be consumed in many forms, such as dipping the sliced stars into yogurt. Carambola is added to smoothies for a tropical taste. Juiced. One of the most popular ways to consume carambola is served as cool juice. The use of starfruit flowers is rare because of their acidity, but they are a common addition to salads in Java. Infusion. A warm carambola tea offer antioxidant benefits and is great for relieving headaches and ulcers. Powder. Made out of the pulp of starfruit, carambola powder is often used as a dietary supplement, due to its content of vitamin C (ascorbic acid), potassium, and vitamins of the B group. Mostly in the areas where it grows, carambola can also be found in dried form to be taken as a snack, as well as in jams and preserves. Its antioxidant benefits can also be enjoyed on top of cakes, muffins, or pancakes. Liquid extract. Obtained from the leaves of carambola, this preparation can help reduce blood sugar levels and relieve inflammation. It can also be applied topically, combined with vitamins C and E, as a serum to improve skin health. Tincture. Similar to liquid extracts, carambola tincture concentrates the medicinal properties of the starfruit, and should be consumed diluted in water. Carambola is not very difficult to find in its natural form in some organic markets. However, it's not as widely known as other exotic fruits and it is more likely to be available online, where carambola seeds, fresh carambola fruit, and carambola powder can be purchased. It can also be bought online as a supplement, mostly in the form of a serum. Averrhoa carambola components can also be found, mixed with other herbs, in some dietary supplements for weight loss. Carambola is classified as a tropical and subtropical plant. Mature trees, though, can tolerate freezing temperatures for short periods and sustain little damage at temperatures as low as 27°F (-2.8°C). This species needs moisture for optimal development, as well as some rainfall evenly distributed throughout the year. In Australia, it is claimed that fruit quality and flavor are best where annual rainfall is 70 inches (1,800 mm) or somewhat more. Carambola trees do well on sand, heavy clay, or limestone soil, but they will grow faster and bear more fruit in rich, loamy soil. It needs good drainage; it cannot stand flooding. The starfruit tree needs full sun to thrive. A spacing of 20 feet (6 m) works very well, but if the trees are on good soil, no less than 30 feet (9 m) should be considered. Planted in damp peat moss, seeds will germinate in one week during summer, but require 14 - 18 days of winter chill. The fruits naturally fall to the ground when fully ripe. For marketing and shipping, they should be hand-picked while pale-green with just a touch of yellow. Carambola trees are relatively pest-free except for fruit flies. The leaflets of carambola are sensitive to light and more or less inclined to fold together at night or when the tree is shaken or abruptly shocked. Carambola. also known as starfruit, is deciduous, slow-growing tree, short-trunked with a much-branched, bushy, broad, rounded crown. It can reach 20 - 30 feet (6 - 9 m) in height. Its leaves grow in a spiral form, up to 6 - 10 inches (15 - 20 cm) long, with five to eleven nearly opposite leaflets, ovate or ovate-oblong. Starfruits can grow up to 2.5 - 6.0 inches (6.35 - 15 cm) long and up to 3.5 inches (9 cm) wide, and have a thin, waxy, orange-yellow skin and juicy, crisp, yellow flesh when fully ripe. They have a more or less pronounced oxalic acid odor, and the flavor ranges from very sour to mildly sweetish. The genus Averrhoa contains only two species of evergreen trees, widely grown in tropical countries as economically important crops and ornamental plants. One of them is carambola or starfruit (Averrhoa carambola) and the other is bilimbi (Averrhoa bilimbi). There are two distinct types of carambola: the smaller, very sour, richly flavored type with more oxalic acid, and the larger, so-called "sweet" type with a mild, bland flavor and less oxalic acid. Many other countries have also developed their own genetic improvement programs, and Malaysia stands out with at least 17 economically valuable cultivars of carambola. Originally from Ceylon and the Moluccas, carambola - also known as star fruit - has been cultivated for centuries in Southeast Asia and Malaysia, and nowadays grows in China, Taiwan, and India, as well as in the Pacific and Caribbean regions and tropical areas of South America. The word carambola comes from the Sanskrit karmaranga, which means "food appetizer." Starfruit was called carambola in the Indian language Malayalam, and kept that name even when the Portuguese imported it to Africa and South America. When first introduced in southern Florida around 1887, A. carambola was seen more as a curiosity and as a decorative fruit due to its peculiar star shape. The genus Averrhoa was named after Averroës (Ibn Rushd), a 12th century Arab physician and philosopher. There are not a lot of countries producing starfruit at a competitive commercial level. Taiwan is the largest producer and dedicates 710,428 acres (2,875 ha) to the cultivation of carambola, while Malaysia has 1,235 acres (500 ha) of the crop, followed by Indonesia and the United States with a combined extension of 434,906 acres (176 ha). Polishing. The acidic varieties of starfruit are used to polish metal, especially brass, as they are able to dissolve tarnish and rust, while its juice is applied to white cloth to bleach stains. Timber. Carambola wood, white during its youth and reddish as it gets older, is also used by the timber industry for construction and furniture.